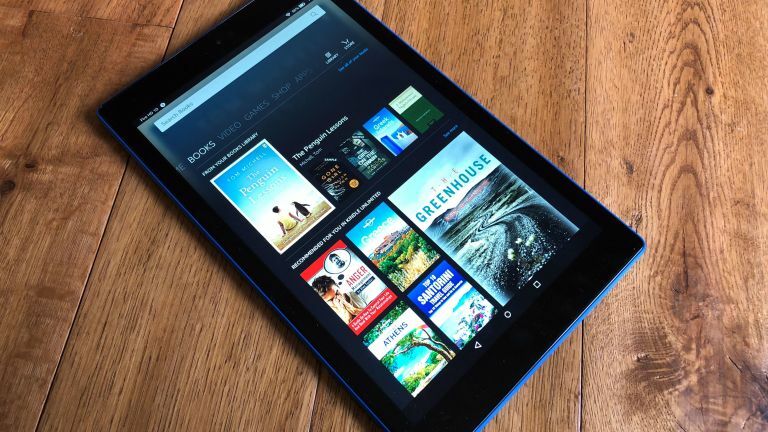 Amazon Fire HD 10 review: can Amazon’s largest tablet take the fight to the iPad? Amazon's keen pricing means top value, but does the Fire HD 10 compromise too much to meet its price point? Amazon's Fire HD 10 is terrific value, but may leave you wanting more. It’s impossible not to draw parallels between this, the largest of Amazon’s tablets, and Apple’s £339 iPad. There are a few headline improvements for the new Fire HD 10 which comes in three colours; black, marine blue and punch red. It now features a new Full HD display boasting 224ppi as opposed to its predecessor’s 149ppi. That's still not in the same league as more expensive tablets on the market but as with everything to do with Amazon's hardware, the spec list needs to be considered alongside the price. Much of the specification is, on paper, as good as many rivals. There’s a new quad-core processor with cited performance of 30 percent more than the previous model and twice the RAM for good measure. Storage has also been improved, up from 16GB to 32 or 64GB. There’s still microSD support, while there’s the kind gift of free unlimited cloud storage for all Amazon content and photos taken with Fire tablets. Again there’s 10 hours of battery life cited (we’ve got around 8-10 hours on our cycles so far depending on how much streaming video we’ve watched). Despite many other manufacturers turning their back on Amazon-powered tablets, Amazon isn’t and is selling better hardware for ever more sensible prices. The deal is that Amazon wants you to be inculcated into its Prime, Kindle and Audible ecosystem. However, we would recommend you opt for the £10 more expensive version of the tablet that removes the ‘special offers’. These special offers essentially just turn the screensaver into a constant ad for new apps. It’s not so bad, but it’s a user experience that’s akin to the bloatware that used to pop up everywhere on Windows – “here’s your new PC that we’ll filled with crap you don’t want!” The Fire ads aren’t that bad and some of the ‘offers’ are apps you’ll want. But it still worsens the experience even though there is zero performance hit. One area where the HD 10 has been downgraded is in its rear-facing camera, reduced from 5MP to a shockingly bad 2MP. Presumably this is a cost-saving measure, but it is a misstep because the quality of the produced images are predictably average, the actual experience of taking a picture is weak. We also had repeat offers even after we had downloaded the apps in question. The dual-speakers are fairly decent for a tablet but instead of just being Dolby-branded, it is called ‘Dolby Atmos audio’ in the marketing materials (the Atmos-branding isn’t on the box though, strangely). This is quite odd when you consider the cost and audio quality of many Dolby Atmos soundbars and AVRs. The inclusion of Alexa in more devices is, of course, welcome and she is her usual self here – if you’ve got an Amazon Echo or Echo Dot already, the transition to using Alexa on the Fire HD 10 will be pretty seamless. As ever, Fire OS is extremely Amazon-centric, but it is really simple to use (although you really do need Amazon Prime to make it sing). You’re able to access more information using X-Ray. So much of Amazon’s hardware is centred around the content on offer and the presentation is typically straightforward. The Amazon Fire for Kids app is included and you’re offered to setup an user account for any children in your family. At £190-less than the basic iPad, the Amazon Fire HD 10 certainly has pricing on its side. It can't really be argued with as a route to getting a decent tablet, but it's nowhere near the best you can get. The core specs are OK (aside from the cameras, which are terrible) and if you just need a tablet for streaming, shopping and basic browsing then it's a great option. If you want a better screen or a tablet for work then you'll need to look elsewhere - probably to the iPad or Samsung's Galaxy Tab S3. Oh, and check out our guide to the best tablets, too.